Anna Wintour, the editor-in-chief of American Vogue, is one of the most well-known names in the fashion industry. Her fierce business acumen and canny ability to identify and set trends in her own right, swiftly made her one of the most respected figures in publishing. However, Wintour is every bit as famous for her icy demeanor and iconic appearance as she is her business prowess. The eldest daughter of newspaper editor Charles Wintour, who went by the nickname of ‘Chilly Charlie’, Anna Wintour is likewise well-known for her forceful, forthright approach and frosty professionalism. When watching Anna Wintour, I never fail to be impressed at how much power she exudes. Although not a particularly tall women, nor very well-built, there is drive and purpose in every step she takes and every gesture she makes. However, I personally believe that she is at her most powerful when behind her trademark sunglasses. 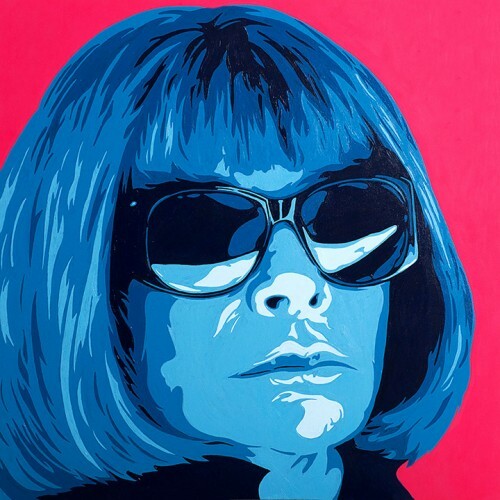 In my portrait of Wintour, the sunglasses are the focal point of the image, and this is a deliberate decision. Although you cannot see her eyes, there is no mistaking the nature of this subject. Despite the concealment of the gaze, you can still get a palpable sense of her forcefulness and no-nonsense personality. When painting the portrait, I found myself wondering about the nature of power. Where does it come from? In the past, I’d often believed it was all locked up in the eyes, but painting Wintour demonstrated that the reverse could also be true. I came to the conclusion that sometimes, true power lies as much in what cannot be seen as what is revealed. The person who does not need to use their eyes to exert control is actually more powerful than the person who does. Indeed, they become like demi-gods; so assured of their own ability to hold attention and respect of those around them, that they do not even need to use the power of their stare. Their self-assurance alone ensures that they continue to be a force to be reckoned with. How Well Do You Know Your Subject? Of course, when the eyes are concealed, this also brings with it an air of the anonymous. In this instance, the sunglasses act as a barrier; preventing us, the viewers, from gaining access to Wintour’s thoughts. This level of anonymity is often shocking in art. Usually, portraiture enables us to gain understanding of the subject; to meet their gaze and try to experience more about their inner-most thoughts and emotions. It’s a rare opportunity to stare at leisure at someone who fascinates and captivates you, without fear of reprisal or criticism. In contrast, anonymity creates a wall between viewer and viewed. There is an air of the defensive about it, like an impregnable fortress, which in turn, can leave the viewer feeling ill at ease, unsure what to take from their experience. In this painting, Wintour is certainly looking at you. Although you cannot see her eyes, you can feel the heat of her cool, appraising stare. Yet the presence of the sunglasses serves to unsettle, as you cannot tell what she is thinking. More importantly, you cannot tell what she is thinking about you. This led me to wonder, is this the representation of true power in portraiture? The rare occasion when the subject is able to not only captivate, but remain aloof and invulnerable to the stare of the audience? In this portrait, it is Wintour who is fully in control. We, the passive viewers, are only able to guess at what is going on behind those sunglasses.